Do you love throwing a New Year’s Eve party each year to celebrate with friends and family? I love throwing a party as much as the next person, but sometimes I just can’t afford to. Don’t let the cost of throwing a party deter you from having one. 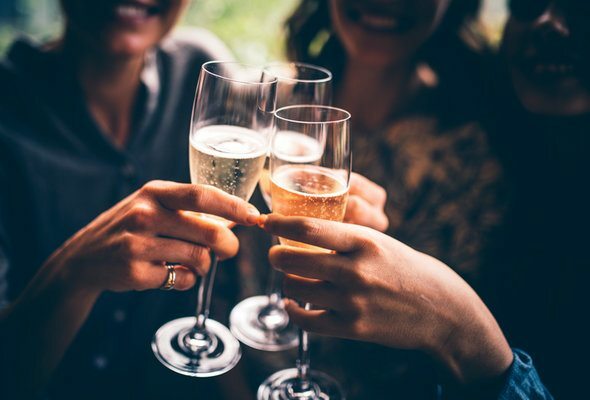 For someone who is just recovering financially from the holidays, the thought of throwing a New Year’s Eve party can be overwhelming. That doesn’t mean you can’t have a great party and still stick to your budget. 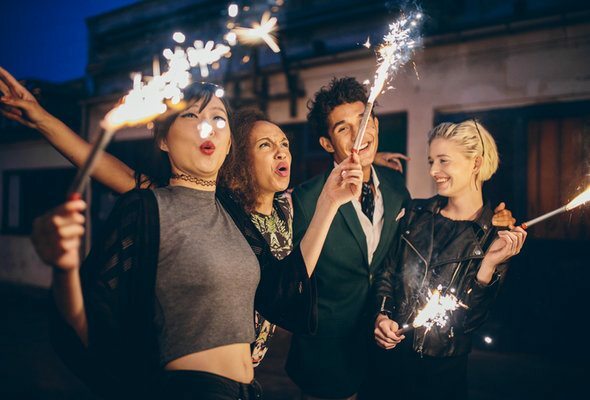 If you don’t want to end up paying for your New Year’s Eve party well into 2017, here are some tips and ideas that your wallet will love. Need help choosing a credit card? Check out our list of the Best Cash Back Credit Cards. I have been to way too many formal New Year’s Eve parties over the years. Most of the time to prepare, I headed to the department store to find a new outfit. When it was over, I had a new outfit, new shoes and a lighter wallet. And that’s not even factoring in buying a hostess gift. Why not dress in a theme instead of having a formal party? Tell your guests to come in pajamas, old Halloween costumes, or in their ugliest holiday outfit. That way you and your friends don’t need to bust their budget on a new fancy outfit. You can have just as much fun in pajamas as you can in an evening gown. It’s easy to go a little crazy with decorations for your New Year’s Eve Party. Try to reuse as many of your holiday decorations as possible. If you want a simple and inexpensive way to set the scene, scatter white votive candles around your home and turn the lights down. Another way to save money on decorations is to hit the dollar store for party supplies like noisemakers, banners, plasticware and you will spend less than at a big box store. Avoid decorations with the year printed on it. You want to be able to recycle them for New Year’s Eve parties in the future. 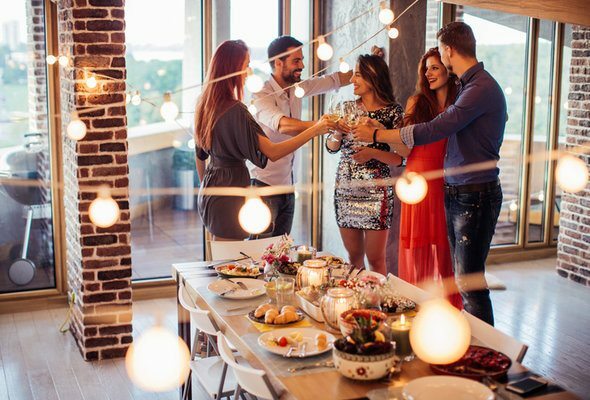 Hosting a party later in the evening after friends and family have completed their dinner plans is a great way to get together and save money. Without the need to make a big dinner or keep everyone fed all through the night, you can save money on food and drinks. You really only need to have snack foods and some appetizers on hand to keep your guests happy. Oh, and alcohol helps. What’s more fun than getting a group of your friends together, piling in the car and driving around looking at holiday lights before they go dark for the year or finding a community event to enjoy. Check to see if your local community center or nearest town is hosting any free or cheap events for New Year’s Eve. Then gather your friends together and go. Are you friendly with your neighbors? Get together and host a block party. You can share the expense among the different families and are able to stay close to home. Want to earn rewards when you spend? Check out our list of the best rewards credit cards. One of the most expensive purchases for New Year’s Eve parties is usually the booze. It’s easy to spend hundreds of dollars on alcohol for your guests. You want to make sure that your guests enjoy themselves, but you don’t want to be paying for the tab into the new year. What do you do? You can handle providing alcohol for the party in a few ways. You can invite your party guests to BYOB. If you don’t feel comfortable asking your guests to provide their own, you can keep the drink menu simple and offer only beer and wine. If you want to provide all the alcohol for your guests, stick to the basics. Choose a few base liquors that can be made into many drinks like vodka, rum and gin. Buying a few juices and add-ins will allow you to make many different drinks from it. Hosting a rocking New Year’s Eve party on a budget isn’t impossible. The whole point of New Year’s Eve is celebrating your accomplishments the past year, while looking forward to the upcoming year. Spending time with those who mean the most to you is just icing on the cake. You don’t need to spend a lot of money to have a great time! Do you have any great ideas to save money hosting a New Year’s Eve party on a budget? Share with us in the comments below! Jen Carl Jen Carl is a writer, blogger and mom living in Raleigh, NC. Once a big city career girl, she happily traded it in for a quiet life in the south. Jen is a reformed shopaholic who loves to help convert others to her thrifty ways. Her expertise includes budgeting, saving money and parenting. Jen enjoys crafting, cooking and DIY projects.